When a Blogger starts a new blog then its impossible to get high cpc ad networks like Google Adsense , Media.net or Outbrain these types of networks demanding high quality content with good traffic , then what should he do ? There are thousands of ad networks which high paying and best for small bloggers . 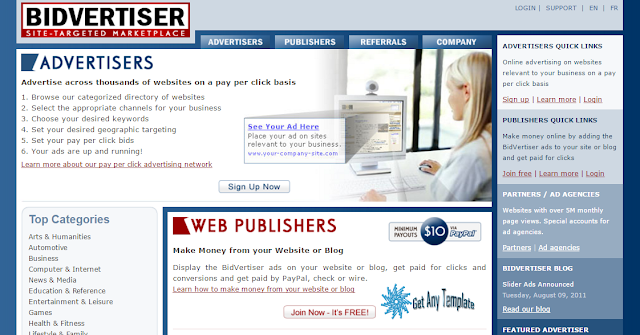 Pop-ad networks are the most demanding and popular for new bloggers which paying high rates . if some visitor visits your blog and click anywhere on your blog then the pop-up ad open , ad impression and click pays you according to the geographic area or region . Visitors from USA , UK and Canada always pay high rates . The minimum withdraws of these pop-ad networks always low . depending on their policies . If you are new in blogging field and struggling to earn money from your blog then you should try one of these ad networks which have mentioned under below . Keep in your mind these pop-ad networks approve fast your blog within 3 minutes and also pay referral commission . 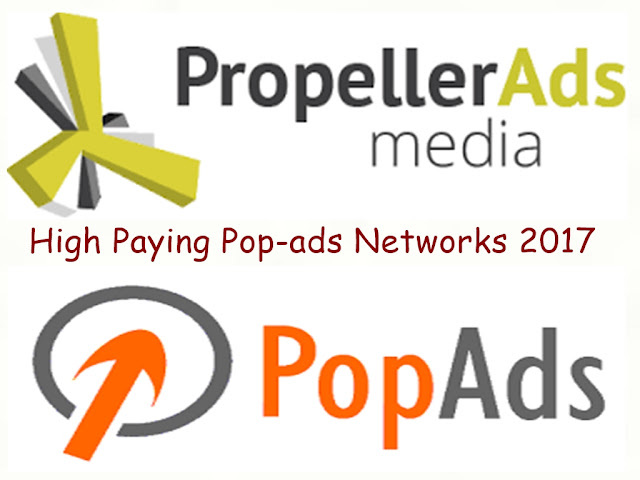 Propeller ad network is one of the most fast growing and demanding ad network with million of positive reviews . Ton of users made hundred thousands dollars in one month from Propeller ad network . The platform has been established since 2011 but just in 2016 million of users join propeller ads just because of its high paying rates . Propeller platform provides mobile and desktop both types of ads . Propeller is CPM ad network which can gives you $1-$4 for every 1,000 impressions . you just need a custom domain to approve this ad network , you can use free domain like (.tk) but don't work with sub-domains like (.blogspot.com) . Sign up for Propeller ads right Now . Best CPM (Cost per mile ) ad network which can pays $1-$4 for every 1,000 impressions. Minimum withdraw $100 via paypal and payoneer . For both mobile and desktop users . Referral program also available . PopAds network is trustful and best Pop-under ads for small publishers with fast approval . 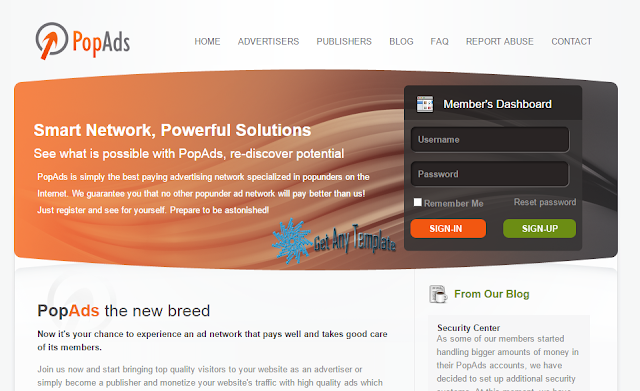 There is no any minimum traffic requirements to join the PopAds network . They allow every type of blog or website like Adult , Dating e.t.c . They provide best CPM rates according to the geographic and region . you can withdraw your amount for only $5 . if you want fast results then you should try PoPAds right now . Sign up PopAds . No minimum traffic requirements . Minimum withdraws only $5 . Allow free sub domains . Revenue Hits ad network is a CPA ( Cost Per Action ) ad network which means they pay only when someone download any software , survey or install any plugin through the ad . They never pay for clicks and impressions but the best thing is you can earn $10-$50 per action . Revenue Hits also provides banner ads with pop-under . There is no any minimum traffic requirements . Free domains and sub-domains are allowed . you just need to place their code in your blog and ads will be shown within a seconds . you can earn thousand of dollars if you have blog about products or gadgets . Sign up for Revenue Hits . Best CPA network which pays $10-$50 per action . Fast approval for free domains or sub domains . Minimum payout $50 via paypal , payoneer and wire . There is no any minimum traffic requirements . Real stats are available on control panel . Banner ads also available with Pop-under . Bidvertiser is one of the old and trustful ad network which is a PPC (Pay Per Click) platform . Bidvertiser also provides banner ads with pop-up also pay for impressions , clicks and action . Free domains (.tk) are allowed but no chance for any Sub domain like blogspot.com you should redirect your blog on free or paid domain if you want bidvertiser . Bidvertiser can pays $2-$4 if you have visitors from USA . No minimum traffic requirement . instant approval for small publishers . Sign up for Bidvertiser . Bidvertiser pays when someone click on your ad . No minimum traffic requires . Minimum payout only $10 . payments via paypal , payza and wire . Instant approval for all publishers . ClickAdu is one of the leading Global ad network which provides best CPM rates than any other pop-under network . Approve Free domains and sub domains , everyone can join this ad network . Real and live stats are available on admin panel you can analyze your traffic . Allow every type of blog or website like Adult , Dating e.t.c . you can earn $2-$3 per day if you have traffic from usa , uk and canada . No minimum traffic requires you'll get instant approval just need to insert their code in your blog . Minimum payout $100 via paypal . Sign up for ClickAdu ad network . Instant approval for free and sub domains . No minimum traffic requires to join ClickAdu . Best CPM rates according to the region . Minimum payouts $100 via paypal . Best Custom Support you can contact with them on skype .